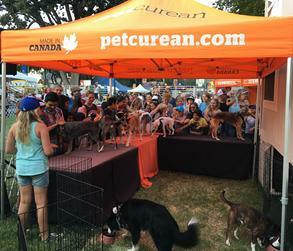 The popular meet, greet & pet area. 10 friendly dogs! High Flying Rescue Dog "BossKoo"
During the performance J.D. talks about the incredible and talented rescue dogs that have come into his life. He demonstrates the TRAINABILITY and HARD WORK that has gone into his training to bring out the natural and instictual abilities of dogs that need a job. The stories of his rescue dogs are inspirational and are a great way of encouraging people to adopt, rescue or foster dogs in need of homes. 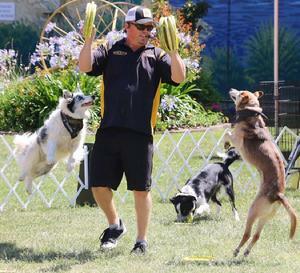 These working dogs that have become part of the K9 Kings will amaze everyone with their natural working abilities and sweetness shown after every performance at the meet, greet and pet area. The young trickster Border Collie "Icicle"
Each perfomance demonstrates the amazing ATHLETICISM of these amazing working dogs. They will captivate the audience with their skills of spinning, flipping and jumping. The best part of watching these dogs performing is they LOVE it!!! AUDIENCES participate in the show! 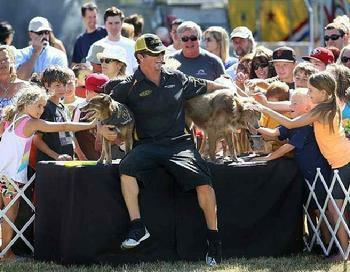 Kids & adults get a chance to throw a frisbee to one of the famous dogs. And of course the FINAL part of the show, MEETING ALL 10 DOGS! A CROWD FAVORITE! It's not very easy to train a dog to play frisbee...try multiple dogs at the same time. J.D. 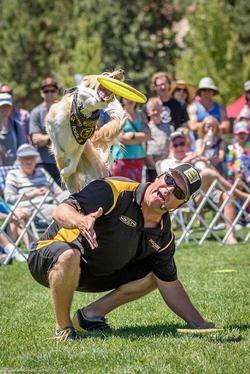 introduces each K9 athlete and then performs amazing DOG COMBINATION frisbee tricks and catches throughout the ENTIRE ARENA. The show is highlighted at the end of the performance with the MEET, GREET and PET area. ALL of the dogs that performed ( 9 dogs ) will be together after the show for everyone to pet in a controlled environment.